Armored fiber patch cable use rugged shell with aluminum armor and kevlar inside the jacket, and it is 10 times stronger than regular fiber patch cable. This will help make the armored fiber patch cord resistant of high tension and pressure. The armored patch cable has a 40% higher rated range of operating temperature, so it provides stable performance over a wide temperature range. This type patch cable is specifically ideal for light to medium duty indoor/outdoor applications. 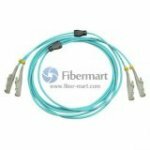 Fiber-Mart supply armored fiber optic patch cable, including 10G OM4/ OM3, 9/125, 50/125, 62.5/125 fiber types. The armored fiber optic patch cords can be with SC, ST, FC, LC, MU, SC/APC, ST/APC, FC/APC, LC/APC, etc. types of terminations.